Giuseppe Gallo was born in Rogliano (Cosenza) in 1954, he lives and works in Rome. Giuseppe Gallo's training as an artist was strongly influenced by his father, a restorer and enthusiastic amateur painter. In 1976 Giuseppe moved to Rome to study architecture. In the same year he held his first solo exhibition at the Galleria Ferro di Cavallo. After being initially attracted to conceptual art, he later turned to reviving traditional painting, concentrating in particular on informal work. In 1979 he made his debut on the International art scene presenting his works at Europa 79, in Stuttgart. In that year he joined Nunzio and together they established a studio in the former Pastificio Cerere in Via degli Ausoni, in the Roman quarter of San Lorenzo. He subsequently enjoyed a six-year collaboration with Galleria Ferranti, in Rome, from 1978 to 1984. In 1984 he held a solo show at the Sperone Westwater, in New York, a gallery which exhibited his works regularly thereafter. 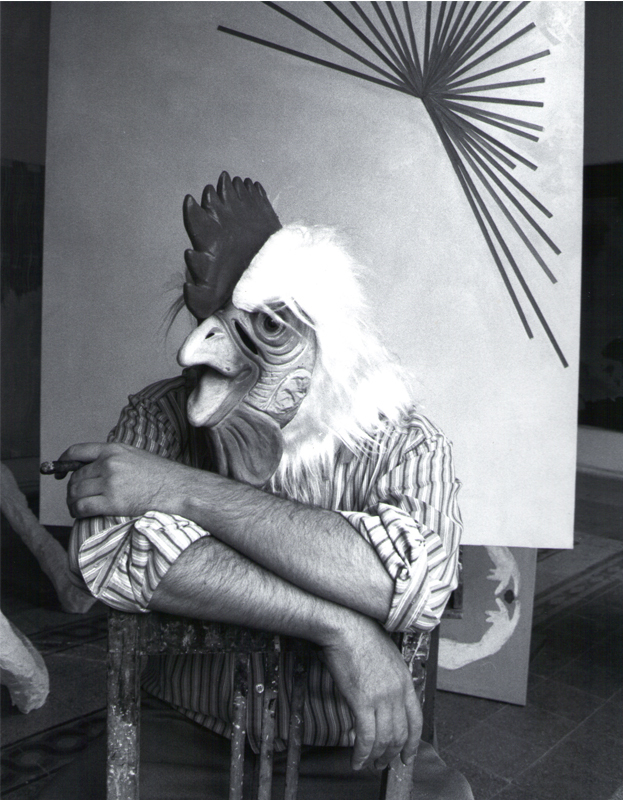 In 1986 he was invited to the Venice Biennale, where he returned in 1990 with his own space in the Italian pavilion. It is during this period that certain critics began to speak of a new Roman school, but the San Lorenzo group of artists rejected this label, since in their view they had developed individual styles and approaches over the years, albeit in a climate of dose cooperation and friendship. In the nineties his painting begin to take on considerable symbolic overtones, his allegorical figures become deliberately paratactical and set in a space where the depth is conveyed thanks to the halo the oil paint creates on the canvas. The curves of the bodies are at times countered by geometric lines, which seem to freeze these suspended figures. Another of his favourite techniques is to cut out forms and apply them onto the canvas. A new medium attracting his attention at this time was bronze sculpture, to which he devoted an entire exhibition, Percorso amoroso. Sculture 1986-2004, at the Galleria Civica di Arte Moderna, in Spoleto. In 2005 his one-man show Mito-rito-sito, held at the Galleria dello Scudo, in Verona, gathered together works selected by Mirta d\'Argenzio and Rolf Lauter focusing on the aesthetic potential of the fragment and the theme of the portrait. As director of the Mannheim Kunsthalle, Lauter exhibited works by Gallo in that same year in juxtaposition with those of Max Ernst, Umberto Boccioni, Paul Klee and Vassily Kandinsky. In 2006 Gallo was able to take on the challenge of placing his work in an outdoor setting when Achille Bonito Oliva invited him to exhibit at the Fresco Bosco exhibition in the park of the Certosa di San Lorenzo, in Padua, for which he devised a powerful installation visitors could experience while walking through it. In 2007 he look part in the San Lorenzo exhibition in Villa Medici, in Rome. His artworks are part of prestigious public collections such as: MoMA, The Museum Modern Kunst Stiftung Ludwig of Vienna, the Contemporain Midi Pirenées of Toulouse, the Groninger Museum, the Fukuyama Museum of Art, the Museum Biedermann of Donaueschingen, the MART of Rovereto, the GAM of Turin and the Parkview Green Museum of Beijing.